The CW cast off a couple of new series earlier this week, canceling No Tomorrow and Frequency. The quirky rom-com and time-travel drama have left some room in the lineup, which the network is now looking to fill with two new shows that are very much on trend. 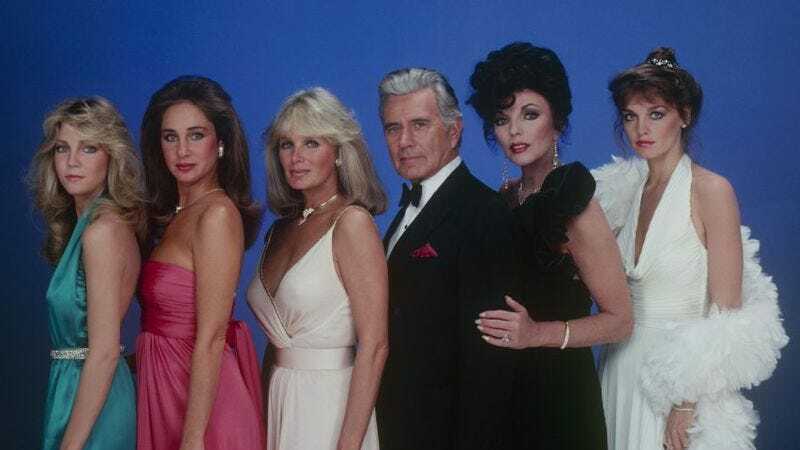 According to The Hollywood Reporter, the CW’s first official series orders for the new TV season have been handed to Josh Schwartz and Stephanie Savage’s Dynasty reboot as well as Valor, a new military-centered series. Schwartz and Savage’s reimagining of the popular, histrionic ’80s drama is going to be a “modern take” on the original’s themes, which presumably means sans the big hair and shoulder pads. We’ll still have two feuding families, the Carringtons and Colbys, but each clan will have its own internal scuffles. For the Carringtons, daughter Fallon will take exception with her father Blake’s (Grant Show) new wife, Cristal (Nathalie Kelley), who is now “a Hispanic woman marrying into this WASP family and America’s most powerful class.” But despite some changes, Dynasty will still be full of “glitz and gloss, while exposing the dark underbelly: a corrupt world built on backroom deals, betrayal, and, in some cases, murder.” Jane The Virgin’s Brad Silberling has already shot the pilot, and will executive produce with Schwartz, Savage, and Sallie Patrick. The CW is also following NBC’s suit, ordering military drama Valor to series. The show, which will reportedly test “the boundaries between military discipline and human desire,” is set in a U.S. Army base, and will follow “an elite unit of helicopter pilots trained to perform clandestine international and domestic missions.” The action kicks off with a botched mission involving one of the first female pilots recruited to the unit, which leads to “uncovering layers of personal and government/military secrets, and leading to a season-long plan to rescue a group of MIA soldiers.” Valor stars Sleepy Hollow alum Matt Barr, Charlie Barnett, W. Tre Davis, Christina Ochoa, Nighel Thatch, Corbin Reid and Melissa Roxburg. Bill Haber, Anna Fricke, Kyle Jarrow, and Michael Robin will executive produce.